How is it possible that Christmas is in a week?!? I feel like I got back from Mexico, blinked and it was Christmas. I also feel like I probably say this every year. The sad part is, I was trying to be proactive and actually made this risotto for my friend Dana pre-Mexico so that I could post it shortly after I wrote about my trip to Tulum. A month later, here I am. But enough apologizing. Let's talk risotto. Similar to my farrotto and my brown rice risotto... I decided to use a whole grain to keep it healthy but still cook in the traditional risotto style. 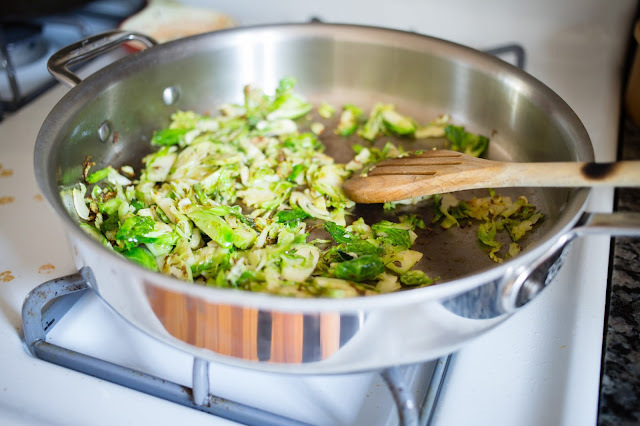 This dish also utilizes some of my favorite fall/winter produce: brussels sprouts, fennel and apple. I wanted the brussels sprouts to keep their bright green color in the finished dish, so I decided to quickly cook these first. Simply saute the thinly sliced brussels sprouts in olive oil for a couple minutes until they start to soften. Season with salt and pepper and transfer to a bowl. Using the same pan, saute the diced apple for a few minutes as well. 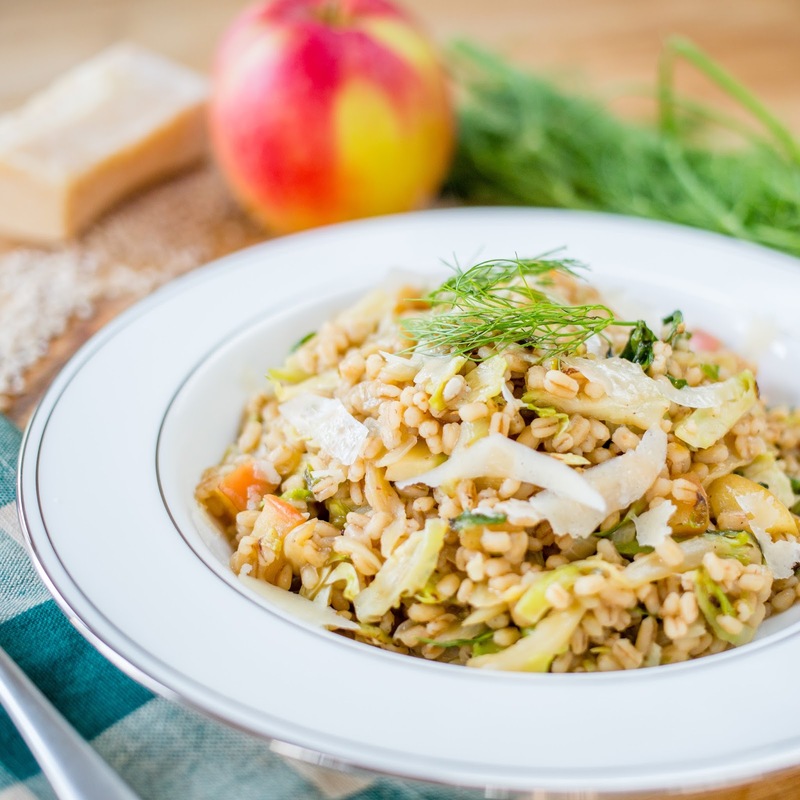 (Similar to the sprouts, I didn't want the apples breaking down in the risotto cooking process, so I also cooked them separately). Transfer cooked apple to the same bowl as the brussels sprouts. Using the same pan, saute the onion, garlic and fennel in a little olive oil until they've softened a little. Add the barley, stir, and allow to toast for a couple of minutes. Next, add the white wine, stir and cook until absorbed. Add a half cup of warm chicken broth and cook until absorbed. Continue this process until the barley is done to your liking. (I prefer it a bit al dente, with a fair amount of bite and chewiness). 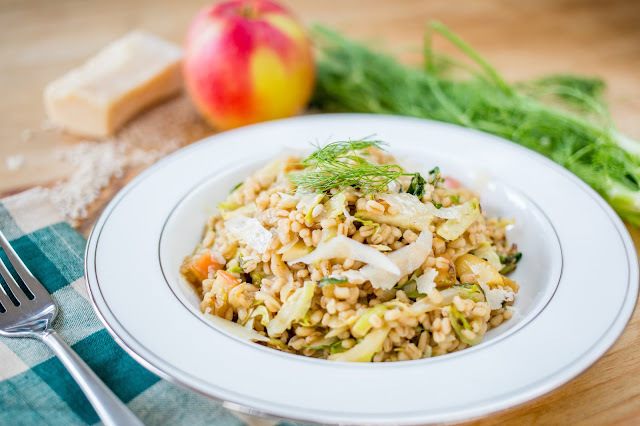 Once the barley is cooked to your liking, stir in the brussels sprouts, apples and some freshly grated Parmesan and allow to cook a couple minutes longer so that everything is warmed through. Serve topped with fennel fronds and shaved Parmesan. Seriously though... where did December go? Place broth in a medium saucepan and warm over medium-low heat. Cover and keep on low simmer. In a deep saute pan, heat 2 teaspoons olive oil over medium heat. Add sliced brussels sprouts and cook 2-3 minutes or until slightly softened (but still bright green). Season with salt and pepper and transfer to a bowl. Add 2 more teaspoons olive oil to the pan and cook the diced apple until slightly softened, about 4-5 minutes. Season with salt and pepper and transfer to the bowl with the brussels sprouts. 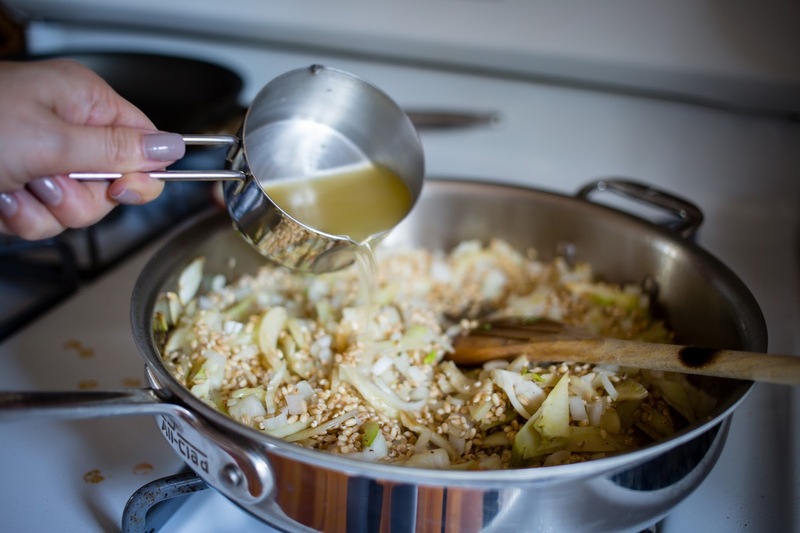 In the same pan, add another tablespoon of olive oil and saute the garlic, fennel and onion until slightly softened. Add barley and toast for 2-3 minutes until coated with oil and fragrant. Add white wine and allow to cook until completely absorbed. Begin adding warm broth, about 1/2 cup at a time to the barley. Cook until it has been absorbed, stirring occasionally. Continue repeating this process, adding 1/2 cup of broth at a time and allowing barley to absorb it until barley is cooked to your liking. Stir in the brussels sprouts, apples and some freshly grated Parmesan and allow to cook a couple minutes longer so that everything is warmed through. Season to taste with salt and pepper and serve topped with a few sprigs of fennel fronds and shaved Parmesan. I just tried this recipe! The pearled barley took much longer to cook than I expected but boy was it worth the wait. My boyfriend and I absolutely loved it and I will probably make it for Christmas as a side dish. The apple added a special flavor that I enjoyed a bunch. In the spirit of experimentation, I remembered I had a couple pieces of crispy bacon and tossed it in at the end! Yes the whole grains take a little patience compared to the risotto rice but I love it and glad you did too!! Great call on the bacon as well :) You'd like the farro risotto I posted 2 years ago. Thanks for the note! !